In October 2015, Pamela Cookey announced her retirement from international sport. During her tenure, England’s star shooter set netball a light around the globe winning an impressive two bronze Commonwealth medals at the 2006 Melbourne and 2010 Delhi games. Along the way she also bagged two World Championship bronze medals and, as England vice-captain, helped inspire England to a first ever global championship gold medal at the Netball World Series. Injury ruled Cookey out of the 2014 Commonwealth Games, but the 31-year-old’s trademark tenacity and determination were showcased in her comeback. 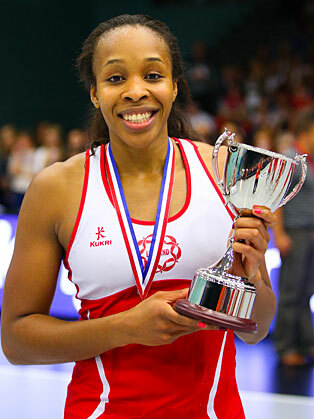 A successful rehabilitation period allowed the ever-popular attacker to reach the 100 cap landmark in May 2015 when she was honoured on court with a standing ovation following a win over Trinidad & Tobago at the Copper Box. Her last game in the red dress was at the Netball World Cup in Sydney earlier this summer. Cookey has also cooked up a storm in the Vitality Netball Super League creating history by becoming the only player ever to have won six league titles. She is currently still a crucial number of defending league champions Surrey Storm.